The source for all practices and traditions that are followed at the Kagyu Monlam is the Seventh Karmapa, Chödrak Gyatso (1454-1506). In a letter to Minyak Gang Monastery in Kham, Chödrak Gyatso described how to combine the practices of the Six Yogas with the Monlam they were practicing. The letter detailed what to do, which texts to chant, and the practice of wearing the white cloth (ras bud byed pa). Usually the term cotton-clad (ras pa) refers to the followers of Milarepa (Mi la ras pa) who were mountain yogis and yoginis clad in white cloth. The other Kagyu tradition of Gampopa is for ordained monks who wear burgundy robes. Evoking the tradition of Milarepa, a particular practice of wearing white cloth occurs at the end of a three-year retreat, and also in some monasteries on special days, such as the combined death anniversary of Marpa (the fourteenth of the first Tibetan month) and Milarepa (the fifteenth of that month). During the traditional three-year retreat, meditators practice tummo—one of the Six Yogas of Naropa and a special practice of Milarepa. It involves generating body heat to overcome the experience of cold. 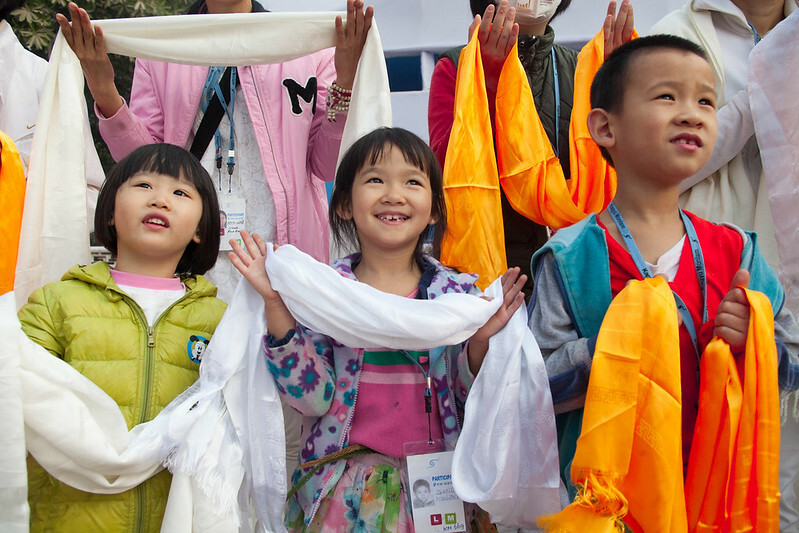 When they end their three-year retreat, the retreatants wear a wet, white cotton cloth, which they should dry with their body heat to demonstrate their success in tummo. 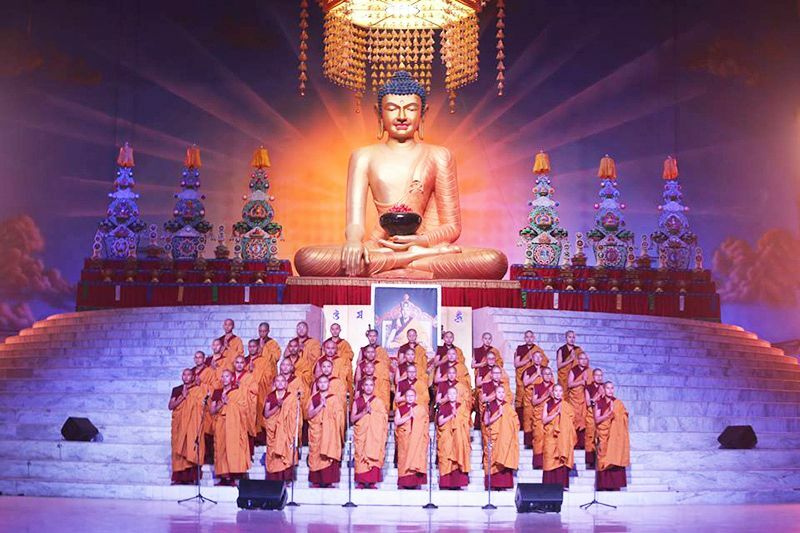 Up until now, this element had been lacking in the Kagyu Monlam performed in Bodh Gaya, so the Karmapa decided that it should be revived this year and continue as a part of the yearly gathering. Prior to tummo practice, the retreatants must engage in vigorous yogic exercises, usually for a month but there was not enough time in the program this year, so they practiced for a week from February 12 to 19 in the main shrine hall of Tergar Monastery. These yogic practices are always done in secret, because spectators could disturb the meditators, leading to broken bones, and for those who look, obstacles could come. All the windows of the hall, therefore, were covered with thick cloth, and sentries were posted around it. Inside the hall, thick mats, a meter and a half square, were laid out in a spacious formality for the 110 meditators. There were many candidates for the practice, and to make it easy, this year it was decided that it would be for monks who had completed a three-year retreat in the tradition of the Six Yogas of Naropa. They should also be under sixty years old, since above that, the yogas do not turn out so well. To teach and remind the older retreatants of the practices, the retreat masters also participated. 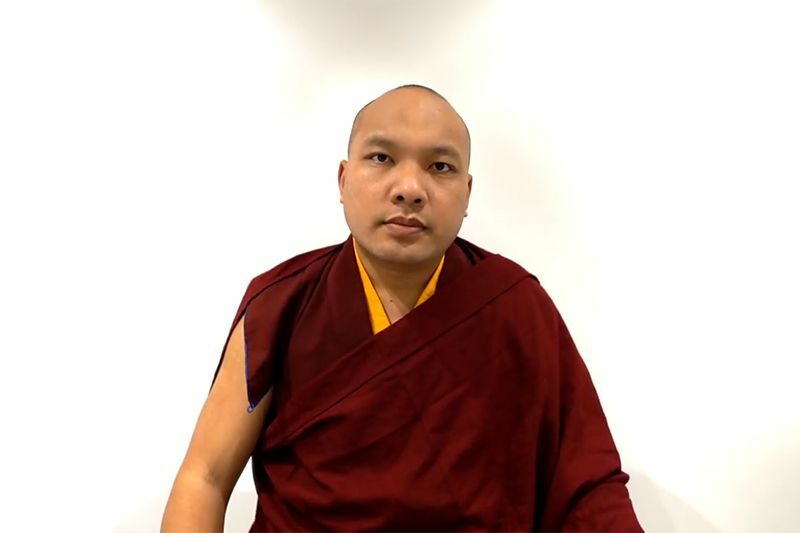 In his letter to Minyak Gang Monastery, the Seventh Karmapa had also noted: “Even though there is no difference in the wearing of the white cotton cloth as it is practiced in the traditions of Naropa or Niguma, we should follow Naropa’s tradition since it has special qualities.” The Six Yogas of Niguma is practiced in the Shangpa Kagyu tradition, and since the Karmapa wished to include these yogis in the Monlam, a special area for them was curtained off in the shrine hall, because the practitioners of these two traditions should not see each other’s yogic exercises. Having stayed up the whole night practicing, on February 19 in the early morning of the last day of the Monlam, the lamas wore a long white cloth wrapped around their bodies, the red Kagyu hat, a yoga belt, and short pants when they exited the main shrine hall of Tergar Monastery. 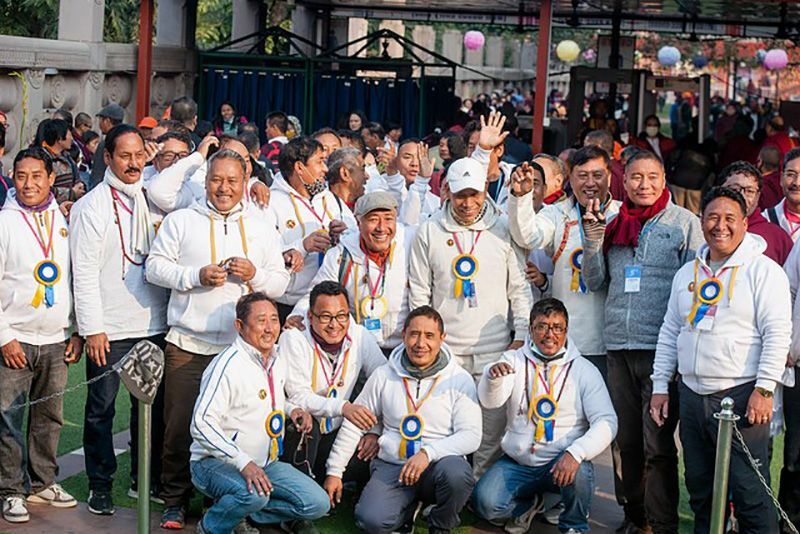 With their arms on their hips and slowly turning side to side, they walked to the Monlam Pavilion between long rows of disciples with khatas to honor their efforts in practice. The lamas came down the central aisle and sat on the stage to the Karmapa’s left while the ordained monks sat on his right. 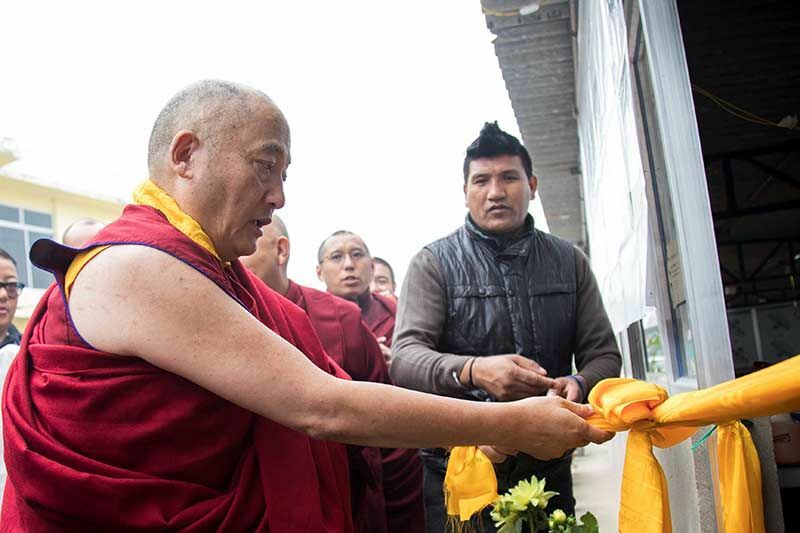 As part of the Offerings to the Guru, the retreatants sang Milarepa’s song, the Essence of Dependent Arising, and received a specially blessed gift from the Karmapa. 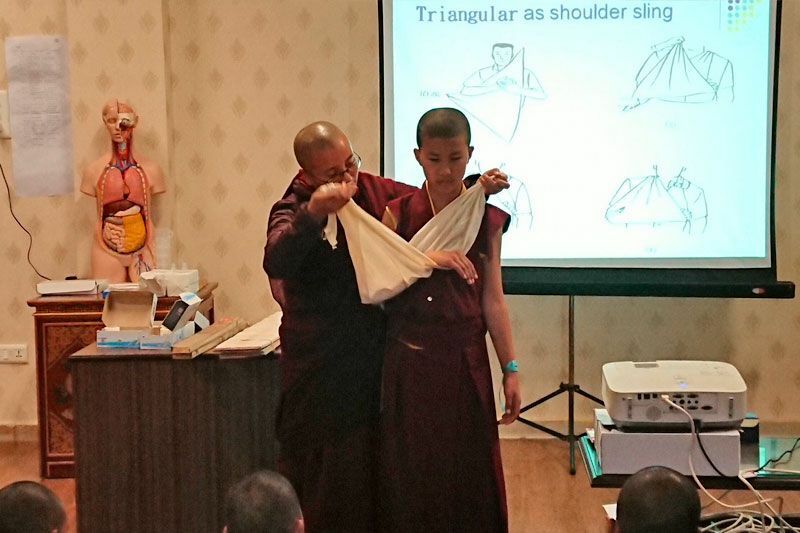 It was an auspicious beginning to the revival of another key element in the Kamtsang Kagyu lineage, famous for being a lineage of great practitioners.